In November 1963, the assassination of Ngô Đình Diệm, South Vietnam’s first president, placed the United States’ decade-long efforts to create an independent South Vietnam in jeopardy. Dwight Eisenhower and John Kennedy both viewed Southeast Asia as an area of importance to US security during their presidencies. In picking up for the fallen Kennedy, President Johnson felt compelled to carry on America’s commitment to the region, and between 1963 and 1965, several foreign policy decisions escalated the conflict. However, Johnson also envisioned himself a champion of major social reform. He worried that conducting a large-scale war in Vietnam would jeopardize “The Great Society,” the comprehensive domestic agenda he sought to achieve. As the 1964 presidential campaign got underway, the president quickly realized that balancing American interests at home and abroad would fully test his political skills. On August 2, 1964, North Vietnamese PT boats reportedly engaged the American destroyer USS Maddox in the Gulf of Tonkin off the coast of Vietnam. Two days later, the situation escalated; on August 4, both the Maddox and USS Turner Joy reported attacks by North Vietnamese military units in the Gulf. President Johnson characterized the attacks as “unprovoked,” ordering retaliatory air strikes. He turned to Congress with these reports, whose members responded swiftly. 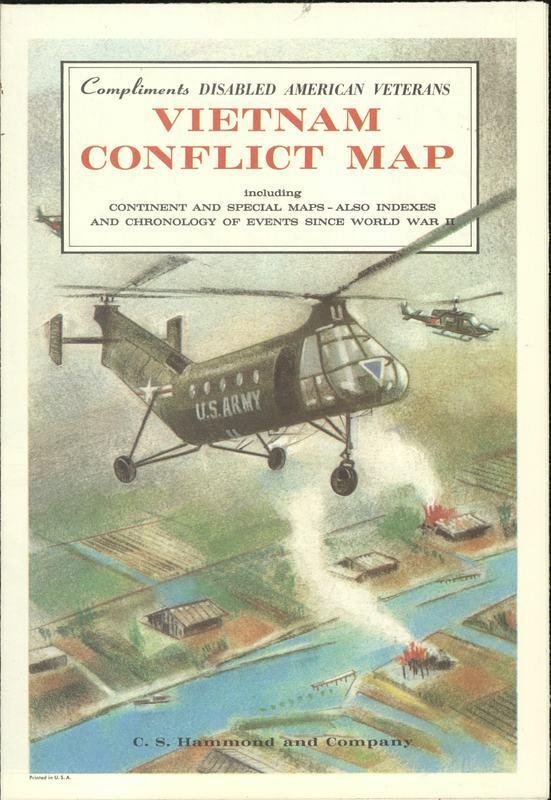 The Tonkin Gulf Resolution authorized military force in Vietnam and granted the President the right to take “all necessary measures to repel any armed attacks against the forces of the United States and to prevent further aggression.” The resolution went immediately to Congress, where the House unanimously approved it following only a 45-minute discussion. In the Senate, many felt the call to ”rally round the flag,” but a number held concerns about the resolution’s legality and the wisdom of “giving the President of the United States war making powers in the absence of a formal declaration of war.” Senator Wayne Morse (D-OR) argued that “history will record that [Congress has] made a great mistake in subverting and circumventing the Constitution of the United States.” 1 Senators Ernest Gruening (D-AK), Frank Church (D-ID), and Albert Gore, Sr. (D-TN) all shared misgivings about Vietnam. The turning point in the Senate debate was Senator William Fulbright’s argument characterizing the resolution as a continuation of current policy that related specifically to the actions in the Gulf of Tonkin. Ultimately, the measure passed 88-2 with only Senators Gruening and Morse dissenting. Military actions intensified after Johnson’s reelection. Within months, several thousand American troops and billions of dollars were committed to the Vietnam conflict, bound by the Tonkin Gulf Resolution that now forced Congress to support military operations via appropriations. In July 1965, Johnson deployed 50,000 troops to Vietnam and privately committed to sending more troops by year’s end. The administration largely concealed its policy from Congress, fearing debate about the war would damage the Great Society, yet it still attracted criticism. House Republicans largely supported a firm policy in Southeast Asia and fighting a war against Communism at any cost. They criticized Johnson for extensive spending on domestic programs that could be reappropriated to defense and his “lack of candor” for confusing the American public about the scope and direction of the military effort. Constituents from across the country wrote to Congress with messages of support for a stronger war effort and the men fighting; pleas to leave Vietnam and an unwinnable situation; and calls for the small but growing contingent of war protestors to be tried for treason. Soon, rifts began to appear between those calling for a full-scale war, those who supported President Johnson’s limited engagement plans, and those who feared the open-ended action escalating into a third World War. In the conflict’s ensuing years, many voices weighed in on the rising costs of military operations in Vietnam. The number of casualties increased as the peace process stalled. 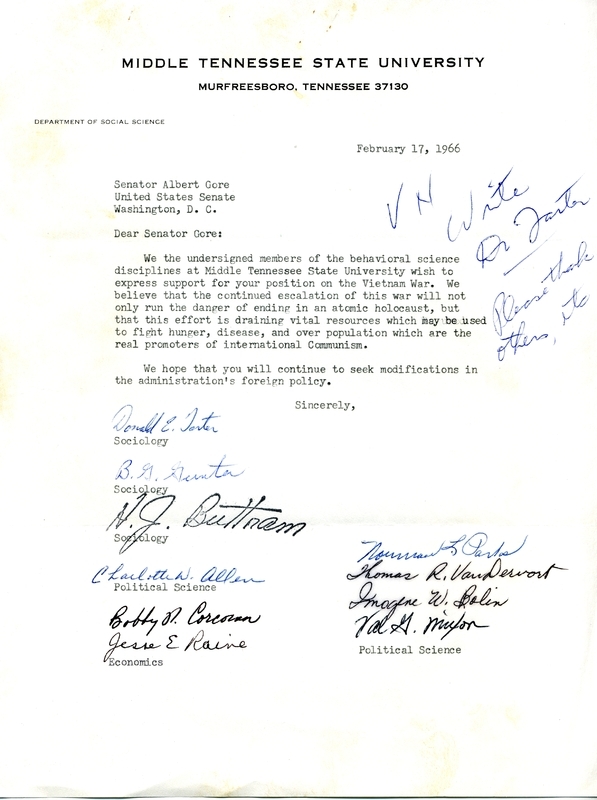 Anti-war sentiment took root among American universities and civil rights groups. Politicians debated the foreign and domestic ramifications of continued action or withdrawal. Eventually, the anti-war movement, growing military and government dissent, and the work of Senate doves were able to disentangle the United States from Vietnam. Following peace talks with Vietnam in France, President Richard Nixon ordered a ceasefire on January 15, 1973. Senator Barry Goldwater, who previously supported the American role in Vietnam, said: "I can't say peace is at hand, but I feel that we're making progress." 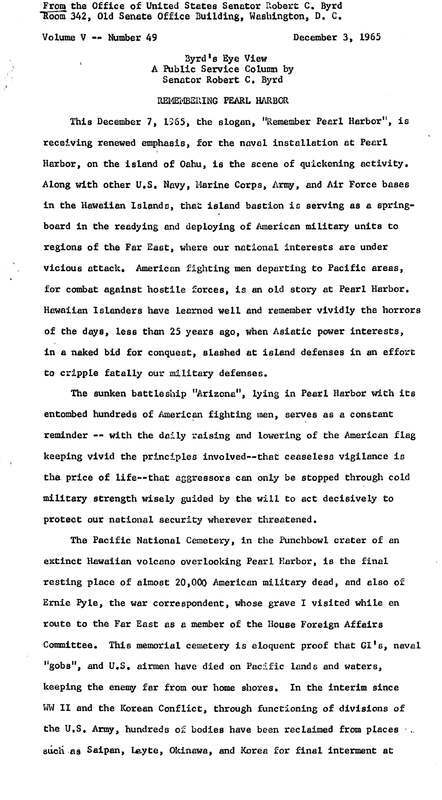 2 In April 1975, as North Vietnamese forces surrounded Saigon, President Gerald Ford called the war, “finished as far as America is concerned.” Materials presented here from 1965 to 1966 document the growing sense of awareness and nervous concern over the unfolding military crisis in Vietnam. 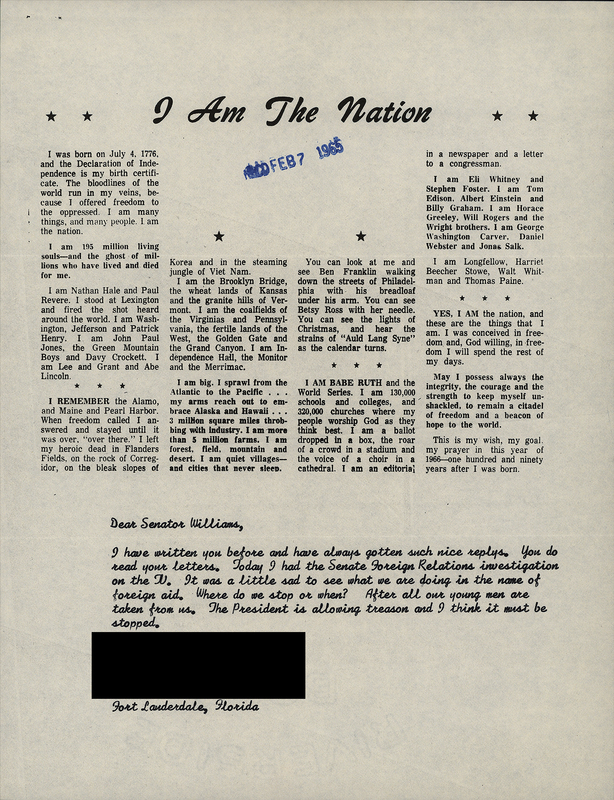 This Fort Lauderdale, Florida resident sent Senator John J. Williams a copy of the poem "I Am the Nation" and a type-written letter expressing their disappointment over the U.S. involvement with the war in Vietnam. "I Am the Nation" was originally written by Otto Whittaker for the Norfolk and Western Railway Company in 1955. 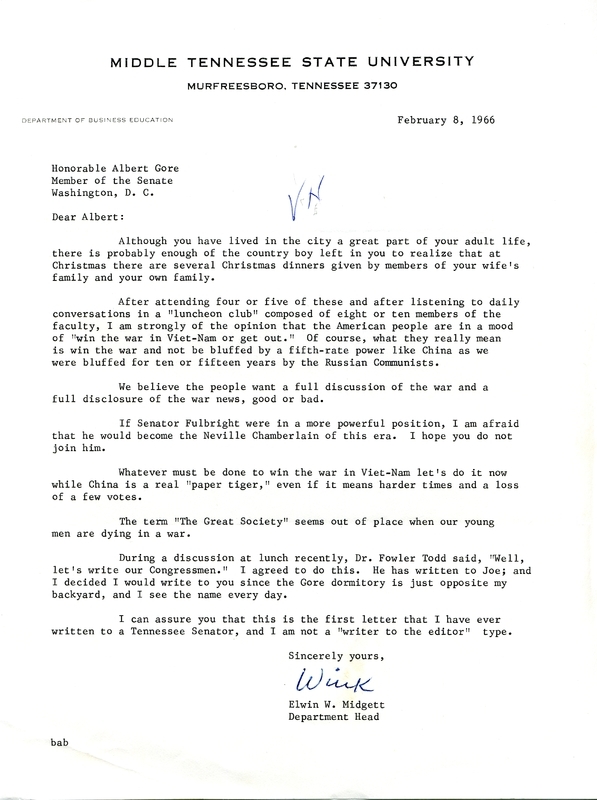 Correspondence from constituent to Senator Albert Gore, Sr. criticizing Gore's efforts to end the conflict in Vietnam. 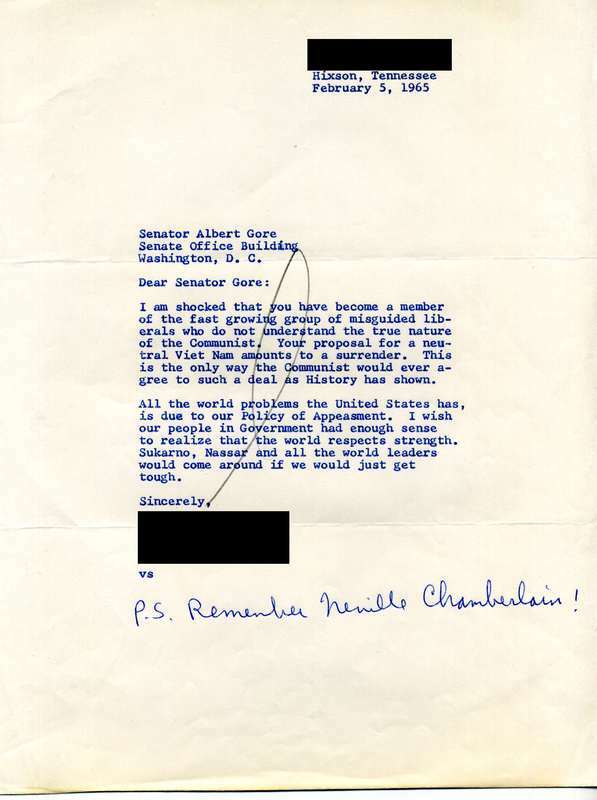 The letter references communism, other world leaders, and makes a particular reference to Neville Chamberlain in a handwritten postscript. 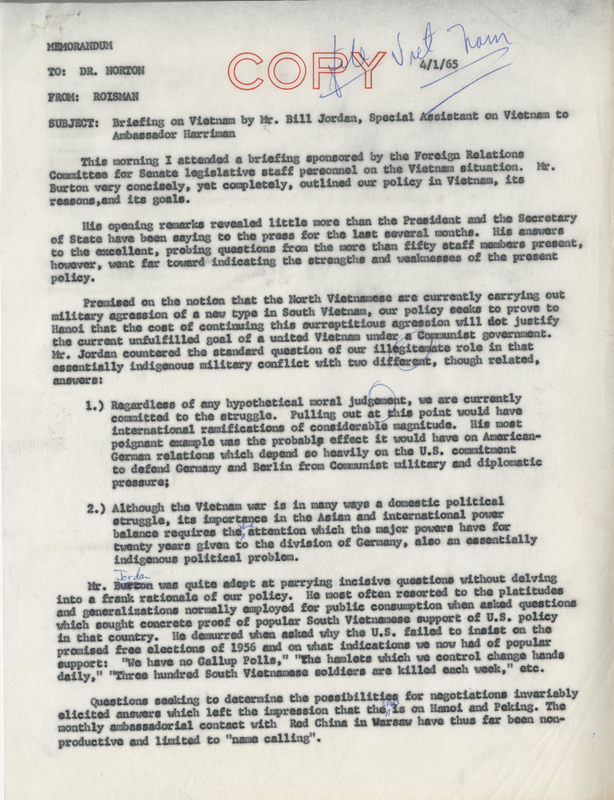 A memorandum prepared following a briefing sponsored by the Foreign Relations Committee for Senate legislative personnel by Bill Jordan, special assistant on Vietnam. 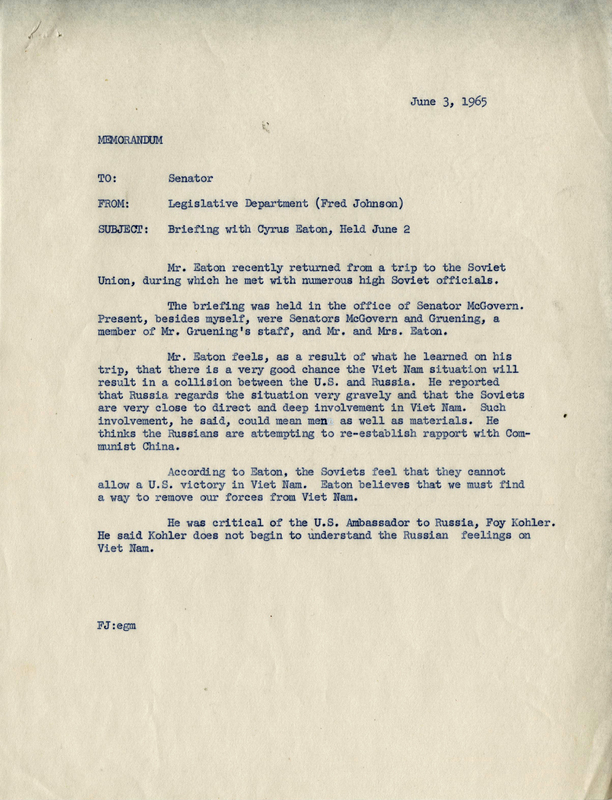 Incorrectly identified as Mr. Burton, Mr. Jordan detailed current Vietnam policy, including its strengths and weaknesses. 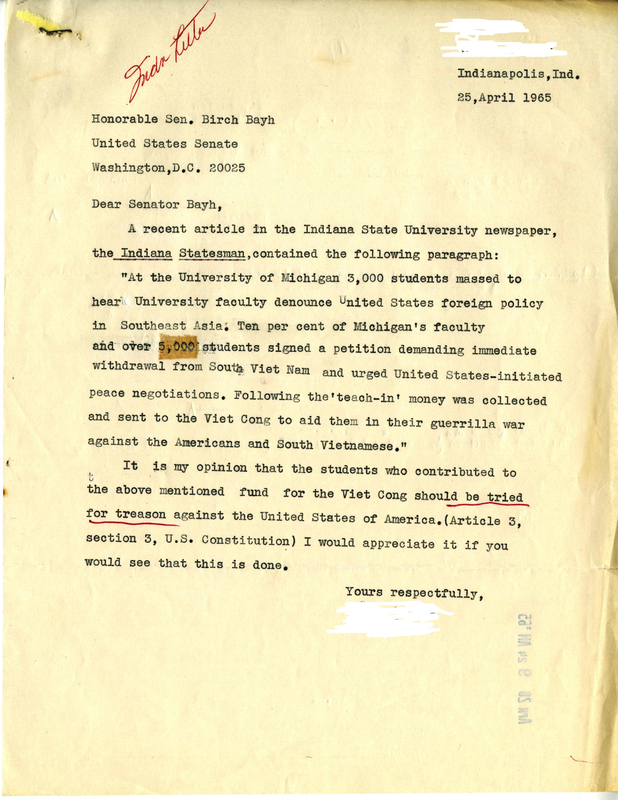 Six Asian Studies scholars at Indiana University-Bloomington expresse their concerns to Senator Bayh over American policies and military action in Vietnam. 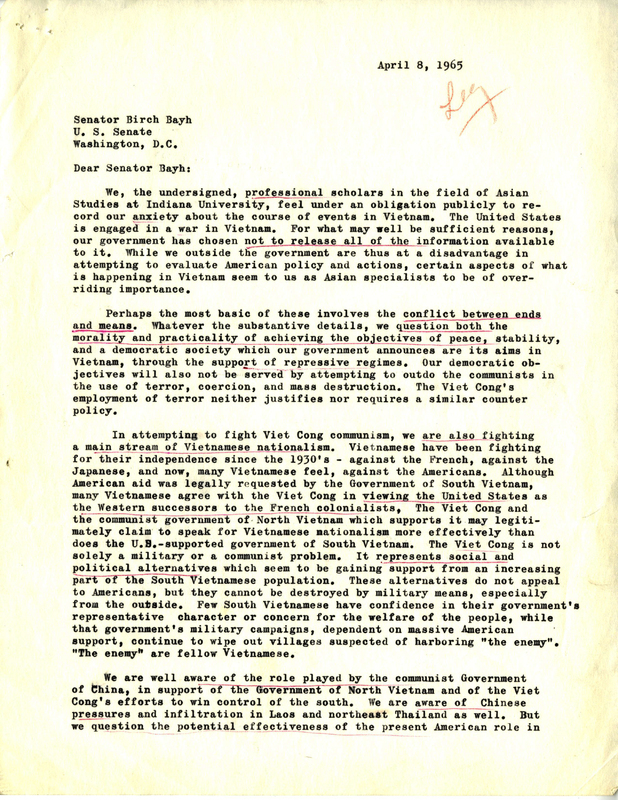 Their two page letter explores their understanding of Vietnamese nationalism, history, politics and culture. The scholars reveal their anxiety and fears of a failed American response in the region. They conclude with an offer to be of service to the Senator in this great matter. 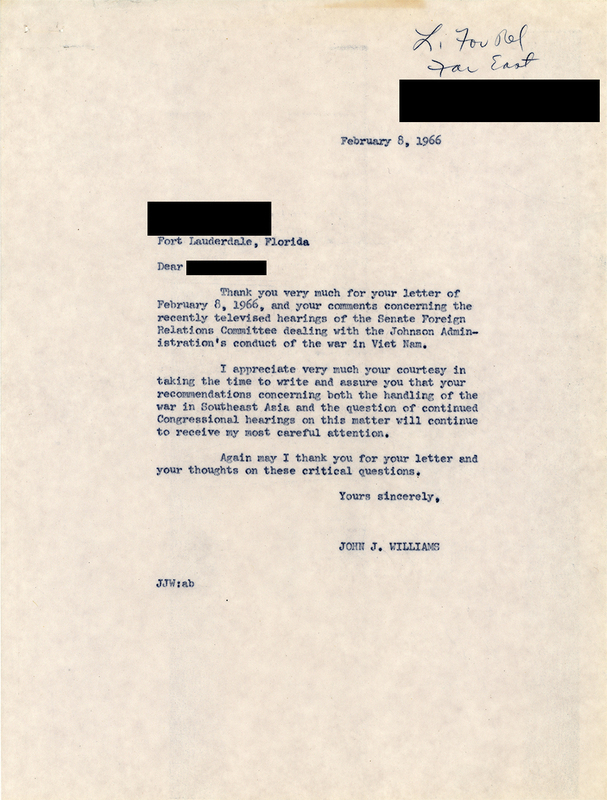 A San Antonio businessman urges Rep. Henry B. Gonzalez to support President Johnson's increased funding requests for the Vietnam War. 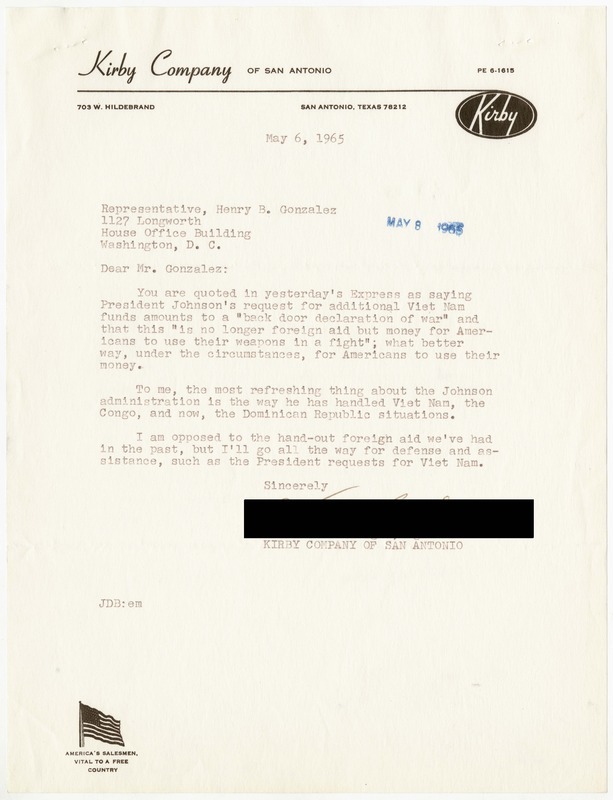 Rep. Gonzalez responds with luke-warm support for President Johnson's Vietnam policy, stating that he is "not entirely convinced of the wisdom of our course." In a rebuke of Secretary of Defense Robert McNamara's actions, an Indianapolis resident expresses his opinion of the situation in Vietnam. 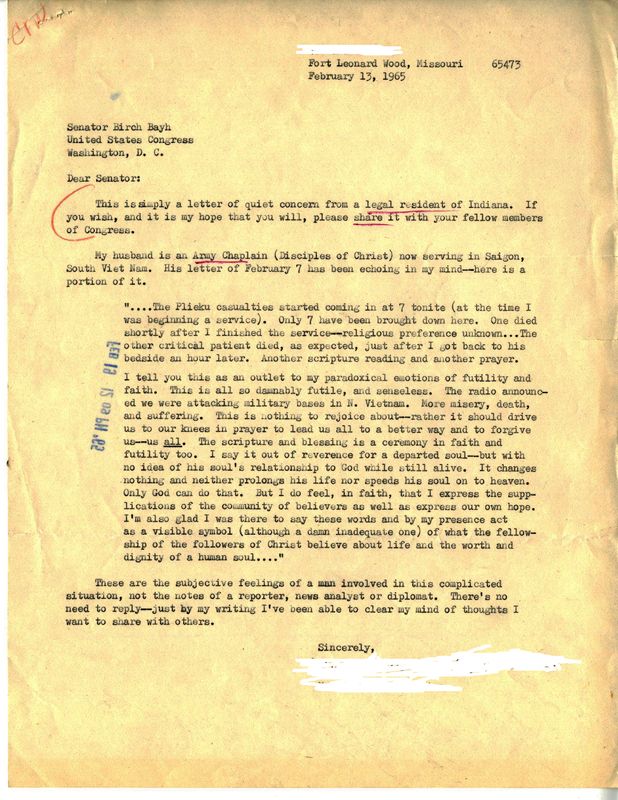 Pointedly, the constituent asks Senator Bayh, "…are you interested in saving McNamara's face or in saving american lives and money[?]" 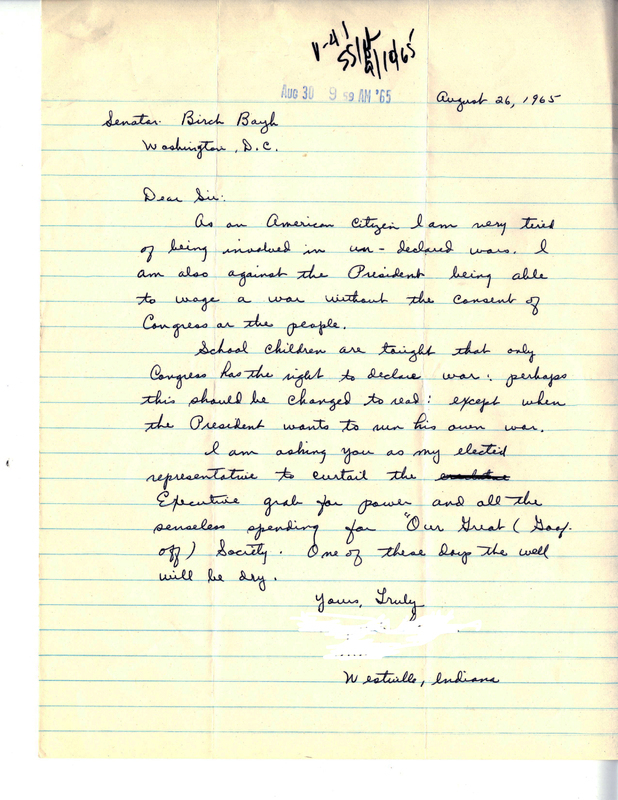 In a letter from Brownsburg, Indiana, a father of a service member writes to Senator Bayh. The letter begins with reservations about making claims against the Vietnam conflict but assures the Senator these issues are heartfelt. 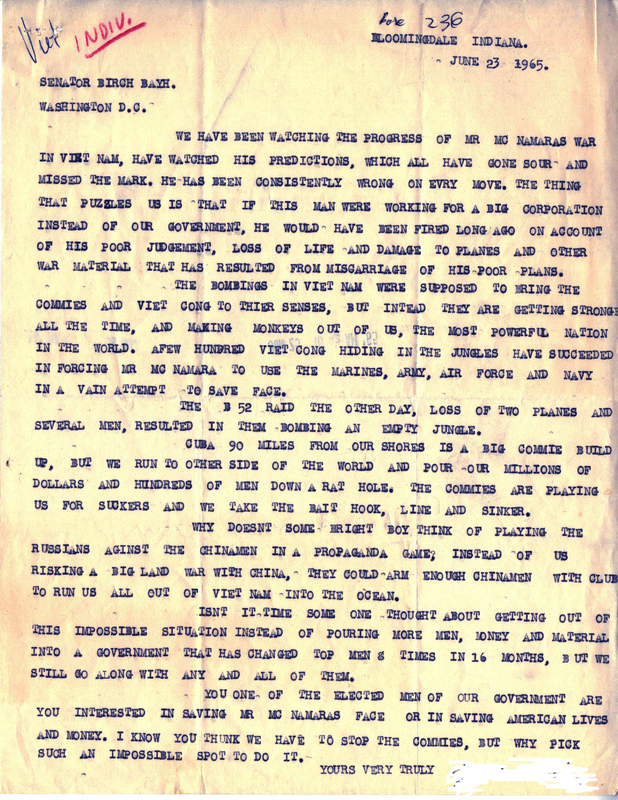 The father continues, "Since receiving letters from my son, I am greatly distressed with American progress in Vietnam as well as the conditions for American soldiers." 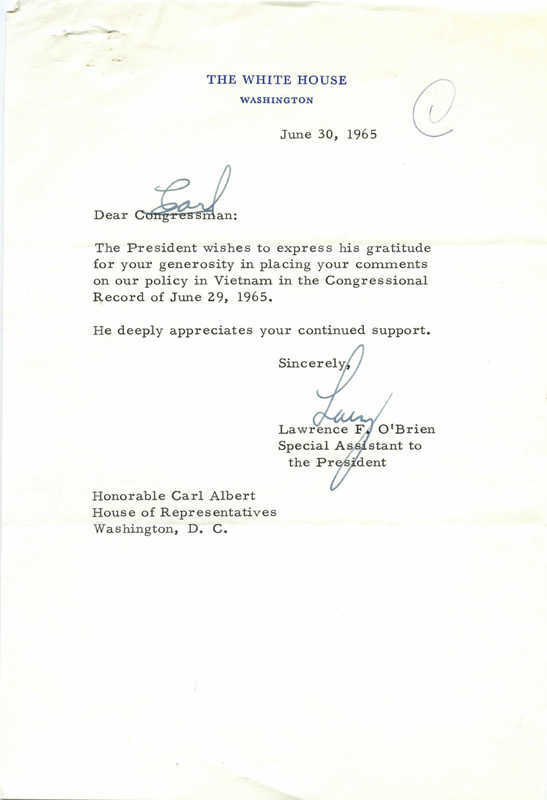 Correspondence from Lawrence F. O'Brien, Special Assistant to the President, thanking Albert for his comments on policy in Vietnam to deter aggression from Hanoi. 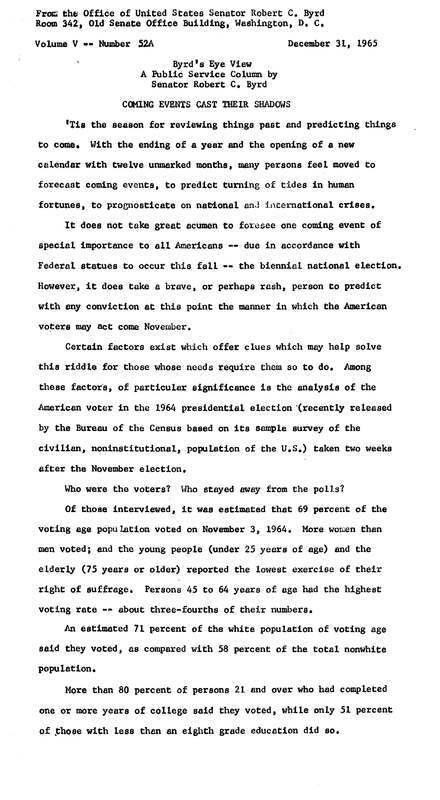 Enclosed is a copy of Albert's comments in the House of Representatives Congressional Record, June 29, 1965. 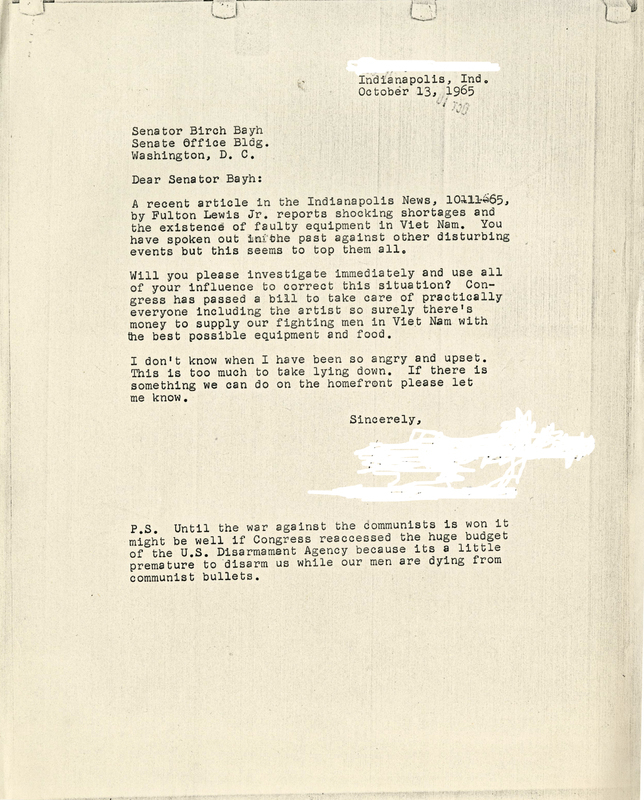 A memorandum to Senator Bayh briefing him on a meeting with Cyrus Eaton, who recently returned from a trip to the Soviet Union. 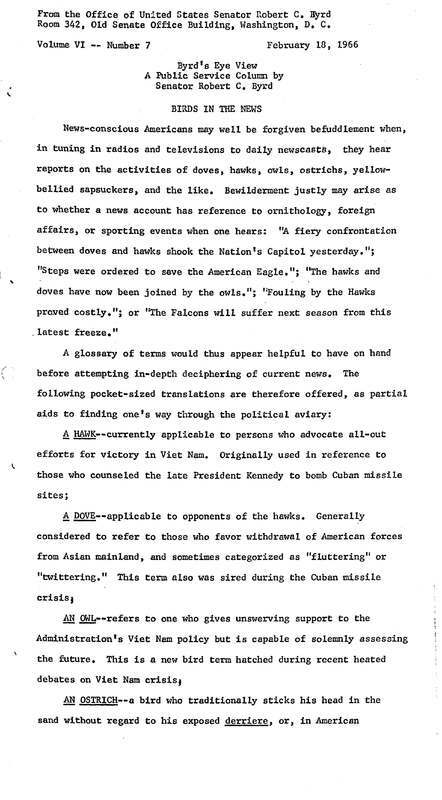 His conclusions are summarized in the memo indicating the situation is very grave noting a high probability that the "Viet Nam situation will result in a collision between the U.S. and Russia." 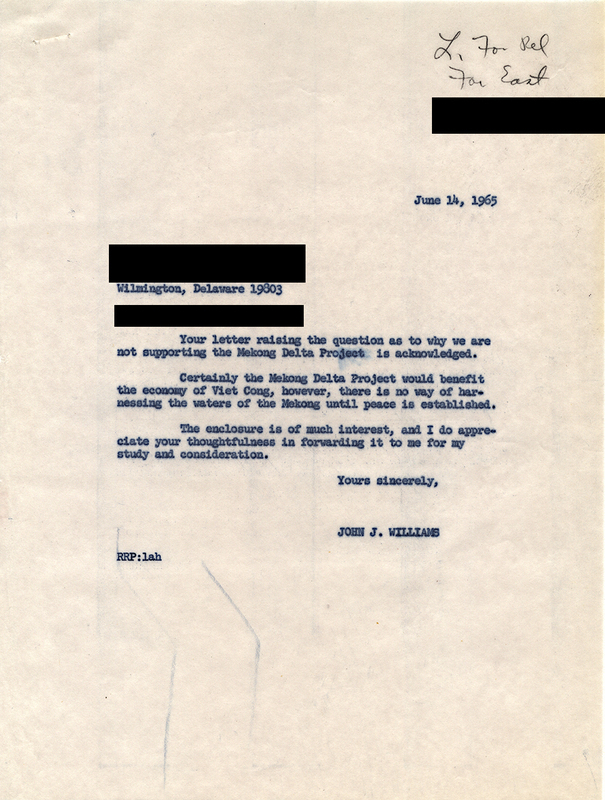 In this response letter, Senator Williams responds to a constituent's inquiry about U.S. support for the Mekong Delta Project, a project announced by President Lyndon B. Johnson in a televised speech at Johns Hopkins University in Baltimore, Maryland. The Mekong Delta River project would be similar to the Tennessee Valley Authority program in developing infrastructure along the Mekong River to improve irrigation, navigation, and bring hydroelectric power to the region. 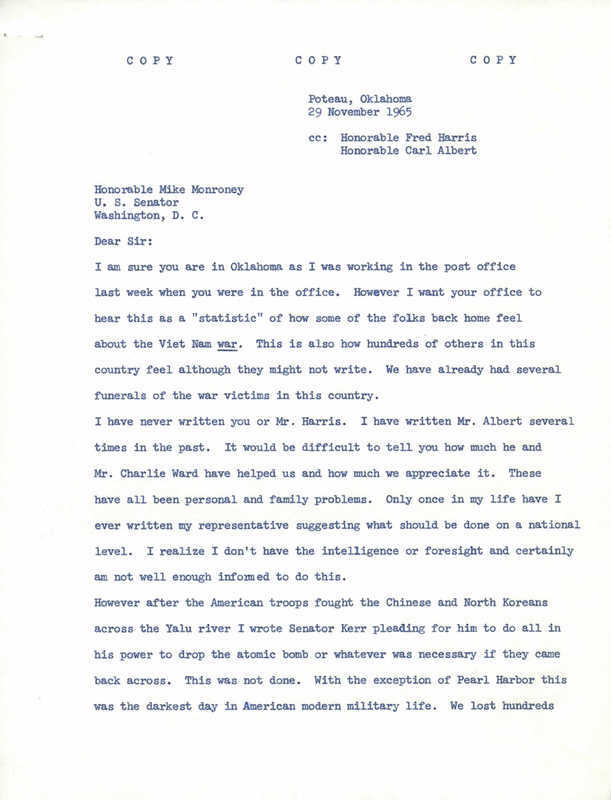 A constituent in Heavener, Oklahoma writes to Carl Albert calling for the removal of US forces in Vietnam. In his response, Albert acknowledges this view and mentions that the Administration is anxious to hear Secretary McNamara's report on his visit to Vietnam. 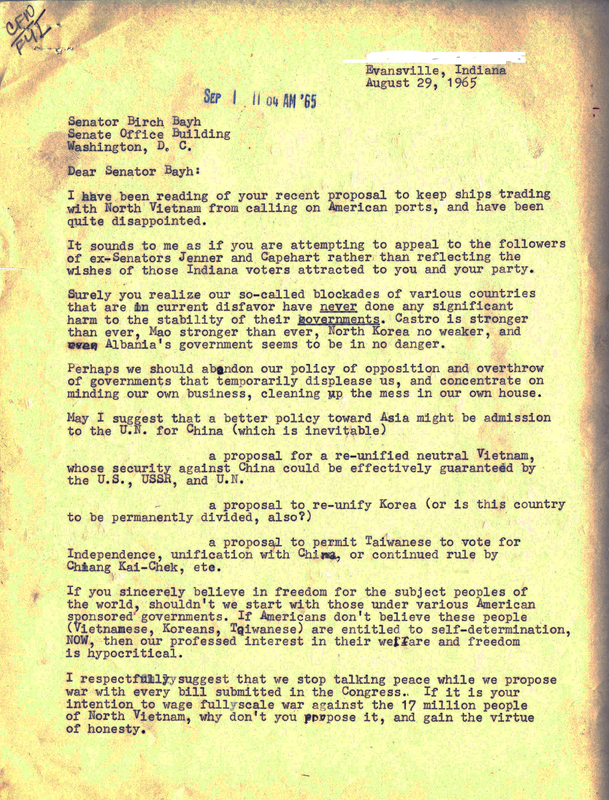 In response to Senator Bayh's proposal of a blockade of ships at American ports who engage in trade with North Vietnam, a resident of Evansville, Indiana expressed his disapproval in a letter. Plainly, he writes, "Surely, you realize our so-called blockades of various countries that are in current disfavor have never done significant harm to the stability of their governments. Castro is stronger than ever, Mao stronger than ever, North Korea no weaker, and even Albania's government seems to be in no danger." 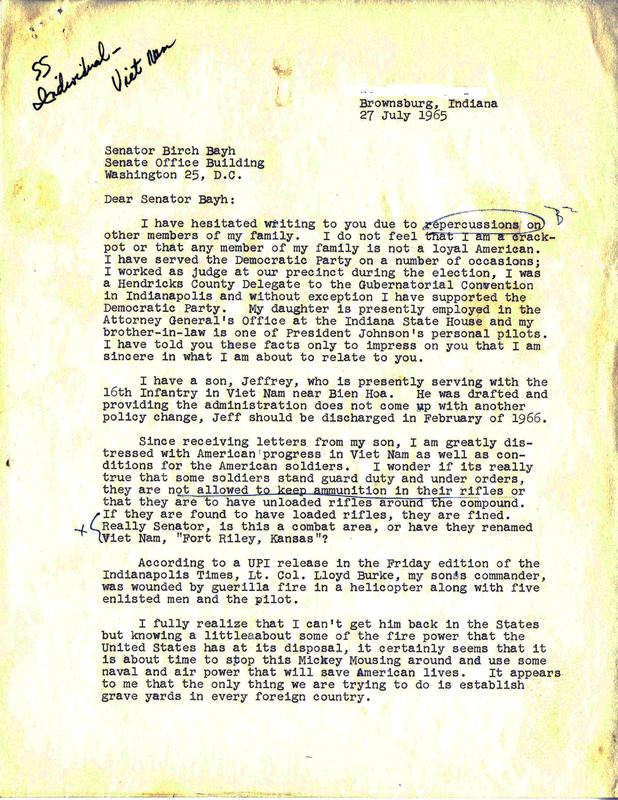 Out of concern for President Johnson's "undeclared war," a resident of Westville, Indiana, calls upon Senator Bayh. The constituent writes, "I am asking you as my elected official to curtail the Executive grab for power and all the senseless spending for 'Our Great (Goof off) Society. One of these days the well will be dry." 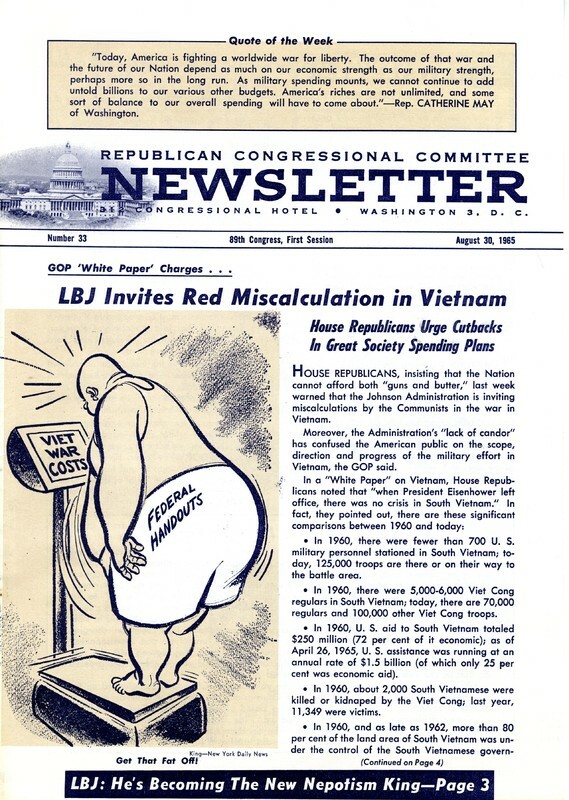 The Republican Congressional Committee Newsletter dated August 30, 1965, featured a political cartoon and article describing Republican criticism of Great Society spending plans and President Lyndon Johnson's "lack of candor" about the military effort in Vietnam. 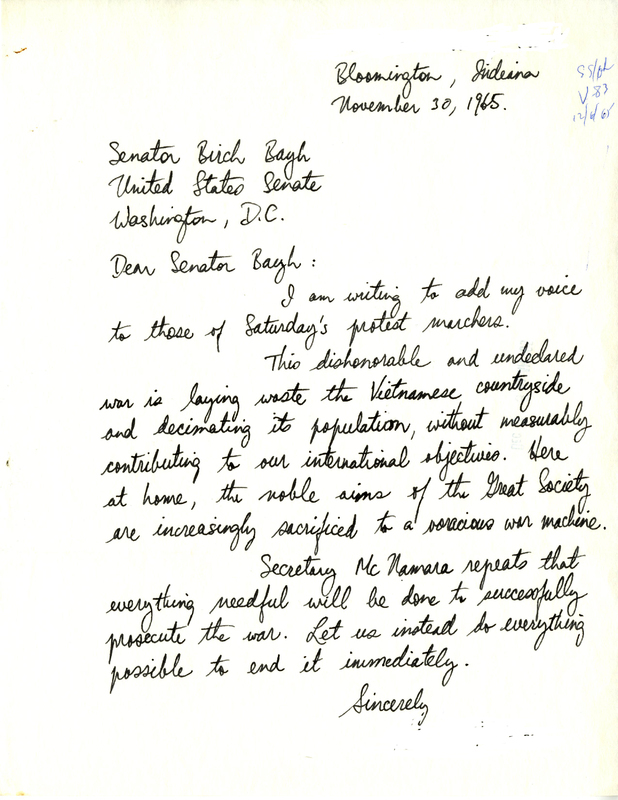 A constituent requests that Senator Bayh investigate reports of faulty equipment in Vietnam. The resident of Indianapolis expressed his outrage, "Congress has passed a bill to take care of practically everyone including the artist so surely there's money to supply our fighting men in Viet Nam with the best possible equipment and food." 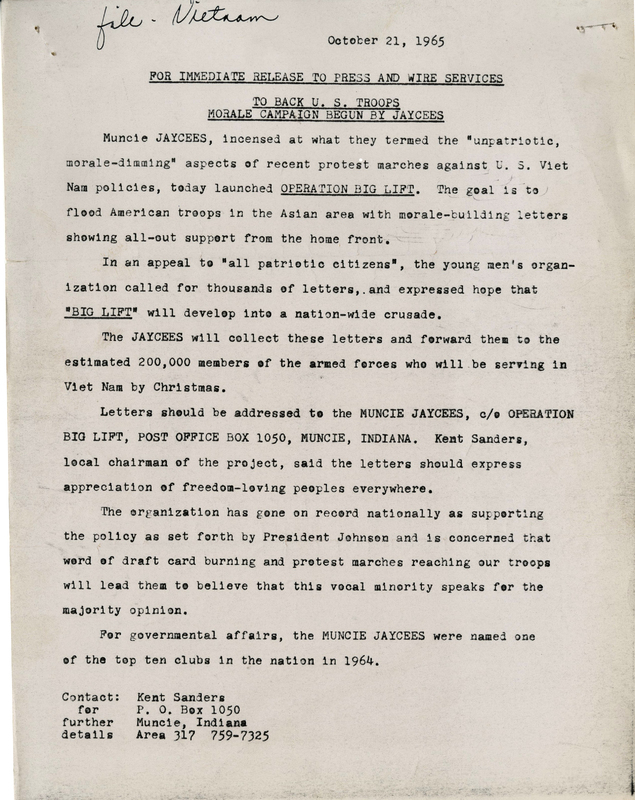 A press release from the Muncie, Indiana Jaycees encouraging citizens to "flood American troops in the Asian area with morale-building letters showing all-out support from the home front." During the late fall of 1965, Congressman Harley O. 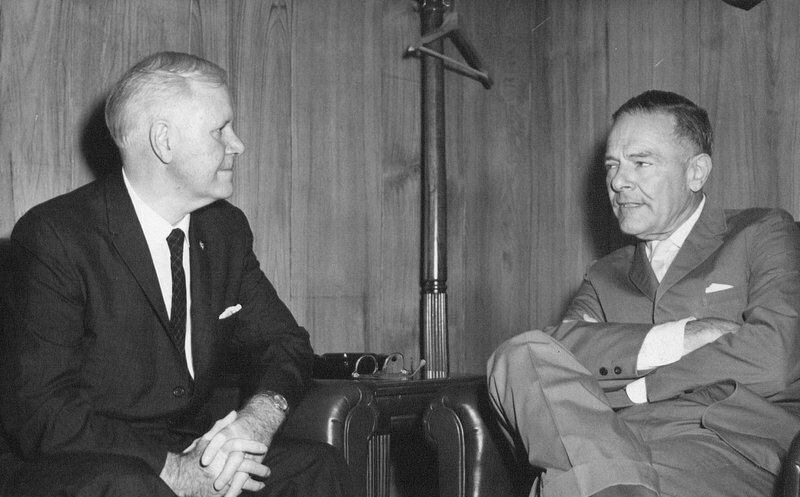 Staggers, Sr. met with Ambassador Henry Cabot Lodge, Jr. at the U.S. Embassy in Saigon, Vietnam. The meeting was part of Congressman Staggers' fact-finding trip in advance of his appointment to the Chairmanship of the House Committee on Interstate and Foreign Commerce. Congressman Staggers also met with two West Virginian soldiers who were being treated in a hospital in Saigon during his visit. 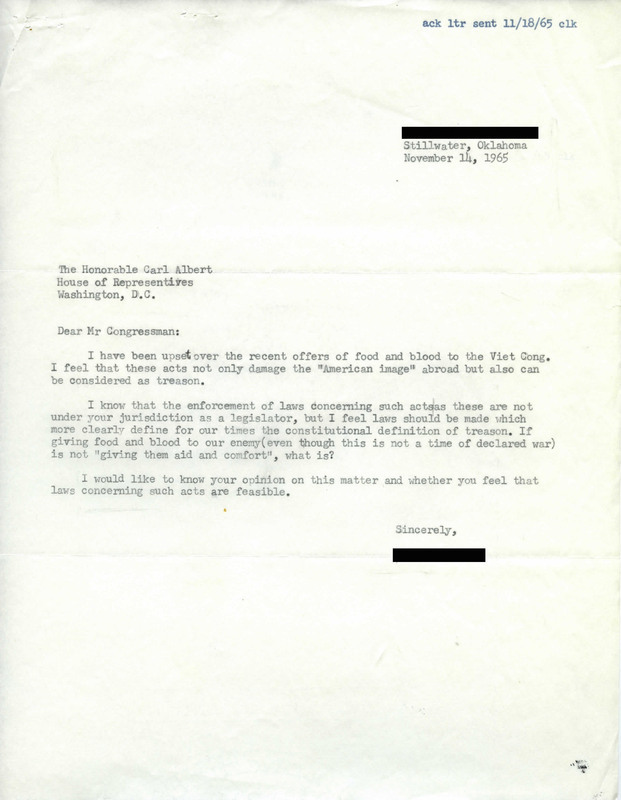 In a November 19, 1965 issue of his weekly column "Byrd's Eye View," Senator Byrd took a strong stance against the practice of self-immolation, which was being practiced by Vietnam War protesters. 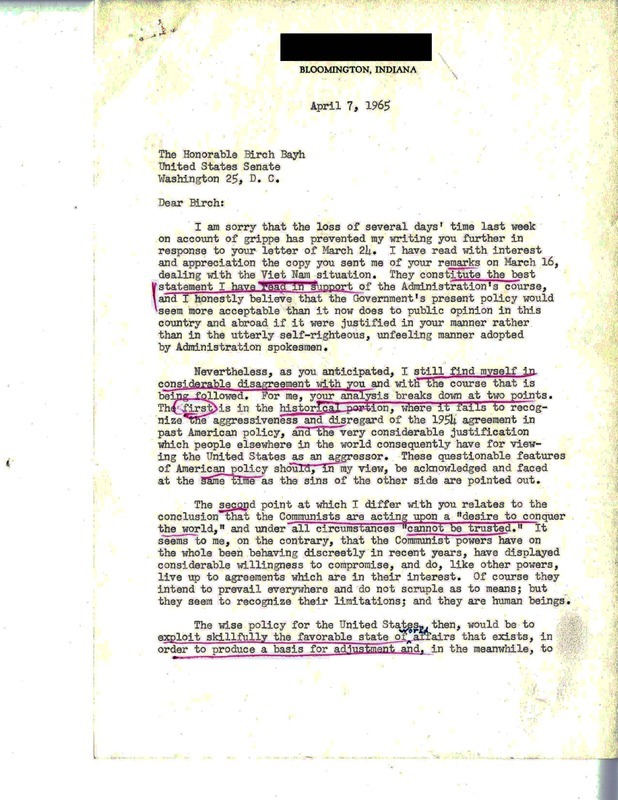 Senator Byrd declared such acts to be "foreign to our way of life" and that its practice spoke to the "deep frustrations and poorly adjusted personalities" of those who were protesting the war. 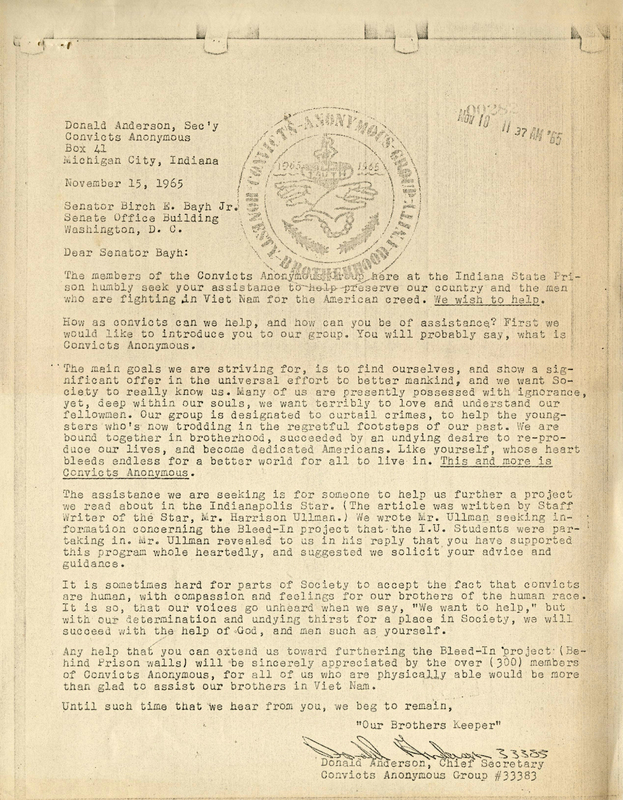 A letter from Convicts Anonymous in Michigan City, Indiana, requesting Senator Bayh's assistance in setting up a blood drive to benefit U.S. troops in Vietnam. A response from a Bayh staffer, Steve Lesher, notes, "I found your letter extremely moving. It is my hope that the Senator will be able to assist you in your desire and, if so, that people throughout Indiana will learn of your willingness to help." 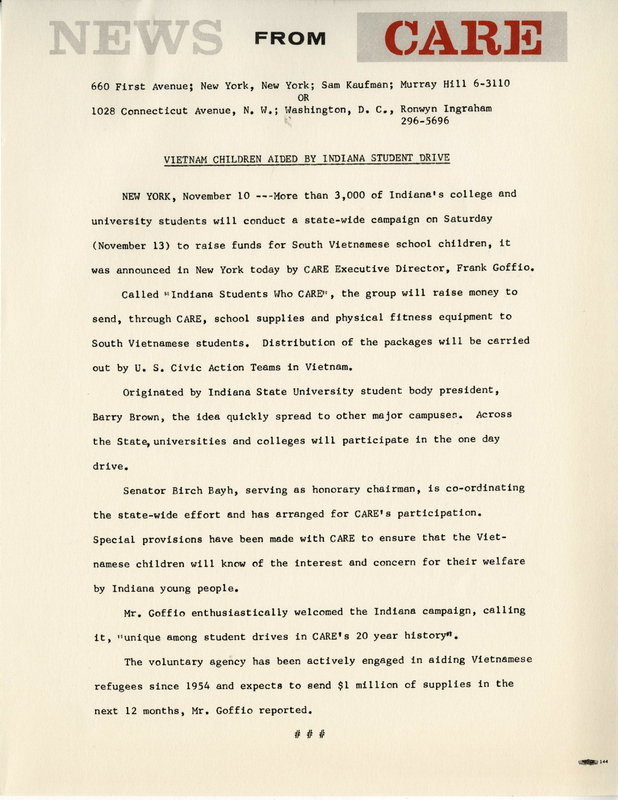 A press release from "CARE," announcing the 3,000-plus Indiana college and university students preparing for a state-wide campaign to raise funds for South Vietnamese school children. Called "Indiana Students who CARE," the group's honorary chairman was Senator Bayh. In a brief note to Senator Bayh, a Bloomington, Indiana resident does not mince words. 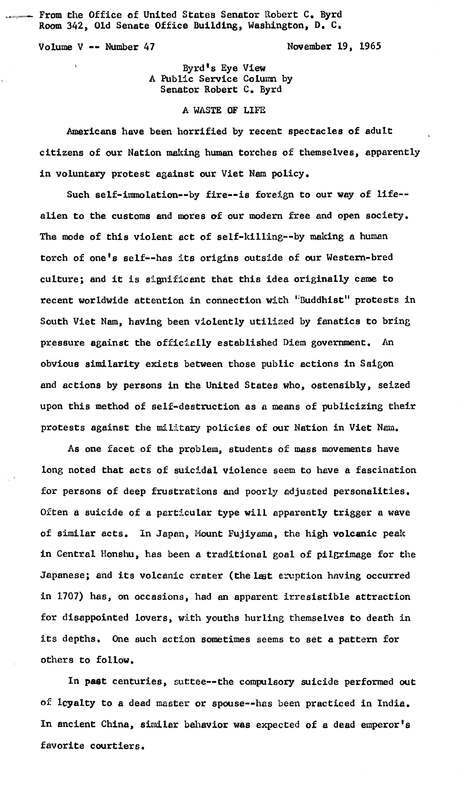 Pleading for an end to the conflict, the constituent summarizes the current situation, "This dishonorable and undeclared war is laying waste the Vietnamese countryside and decimating its population, without measurably contributing to our international objectives. Here at home, the noble aims of the Great Society are increasingly sacrificed to a voracious war machine." 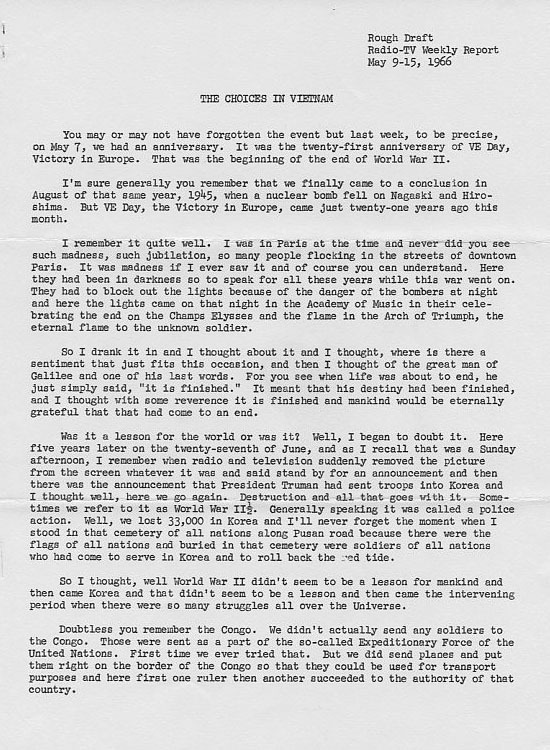 A from constituent in Poteau, Oklahoma writes to Senator Mike Monroney and calls for the immediate end of the Vietnam War through whatever means necessary. A response from Representative Carl Albert thanks the constituent for sharing their views and guarantees his assistance. 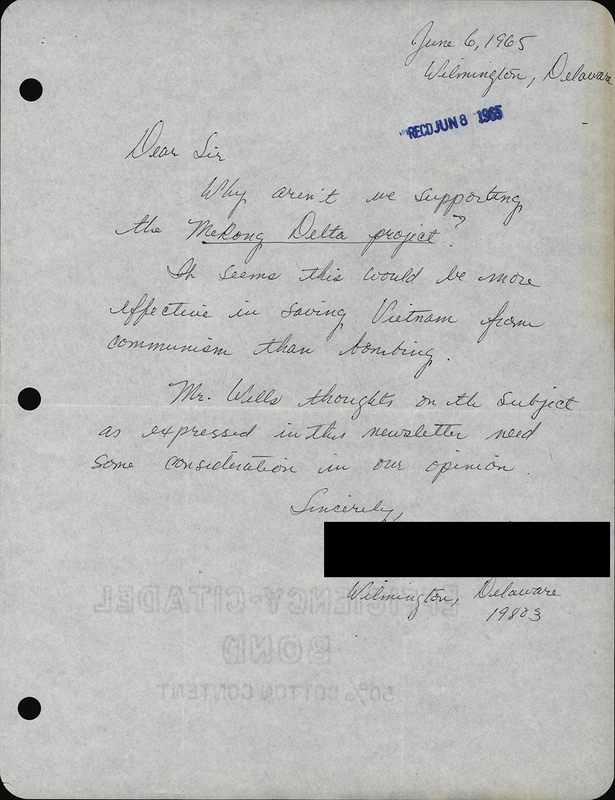 In this response letter, Senator Williams acknowledges the constituent's concern over the United States involvement in the Vietnam War. 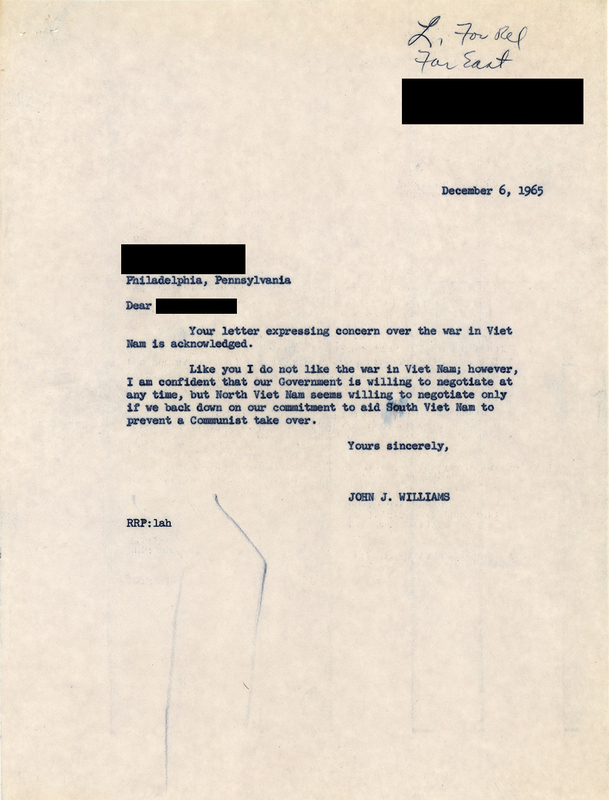 Williams also affirms the United States government's commitment to aiding South Vietnam against the Communist North Vietnam. 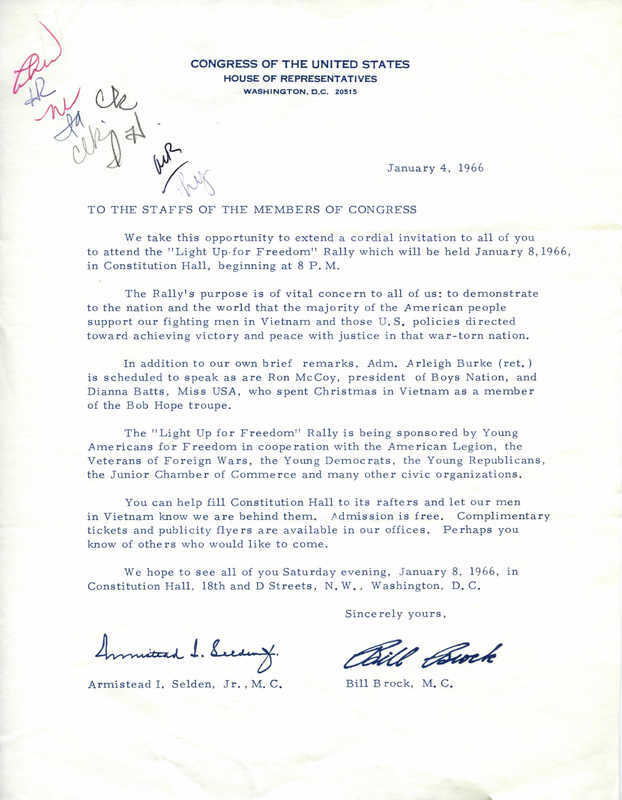 An invitation from officers of the Young Americans for Freedom to the staffs of the members of Congress extends an invitation to attend the "Light Up for Freedom" Rally. 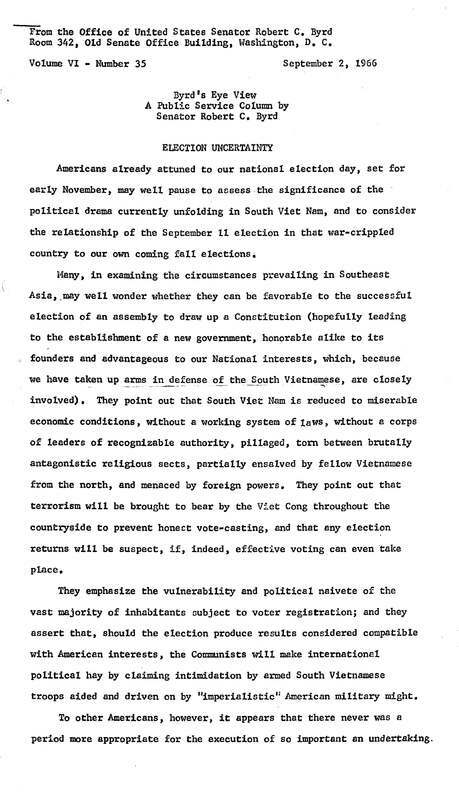 The invitation states that the rally's purpose is to demonstrate support of the US troops in Vietnam and of policies aimed at achieving victory and peace. A publication created by the Young Americans for Freedom entitled "Freedom in Viet Nam" is included. In this exchange, a Wilmington resident attending Stanford University expresses his frustrations with the Johnson administration's policy on Vietnam. He reported to Senator Williams the increase of professors and students who were joining protests against the war in Vietnam all around college campuses in California. 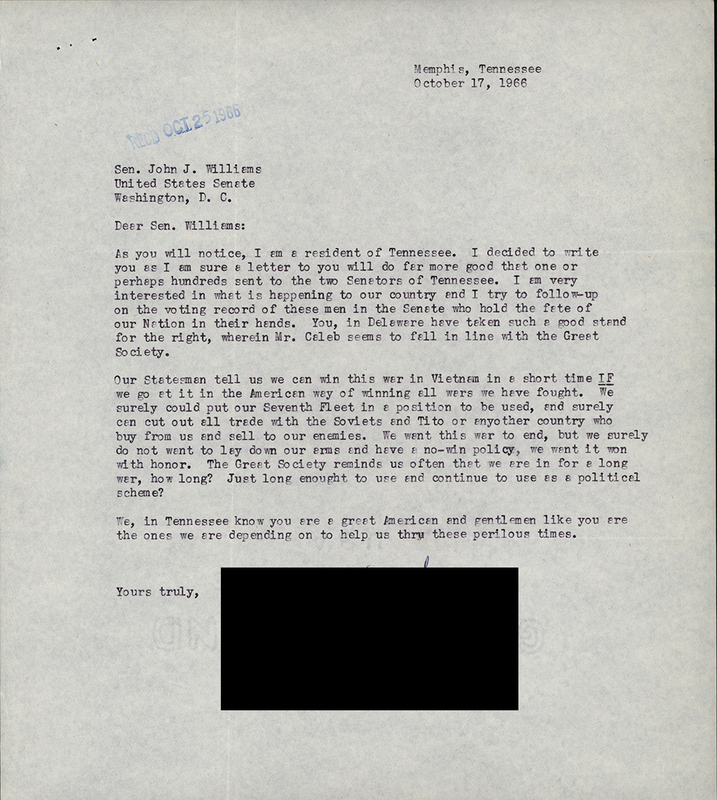 In response, Senator Williams empathized with the constituent's frustrations over the Johnson administration's involvement with the war in Vietnam. 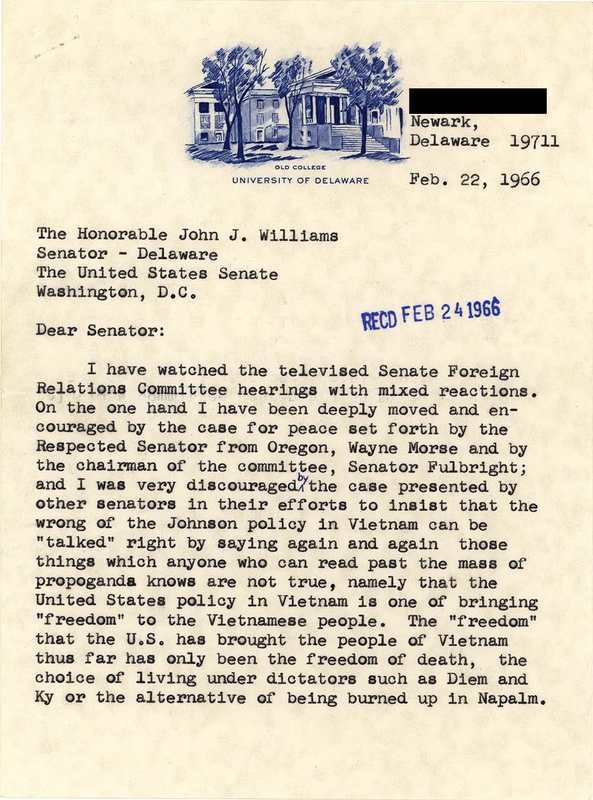 In a well-articulated letter, a freshman student at the University of Delaware calls upon Senator Williams to reassess the war in Vietnam and look closely at Johnson's propaganda. In his response, Senator Williams disagrees with the student's assessment. 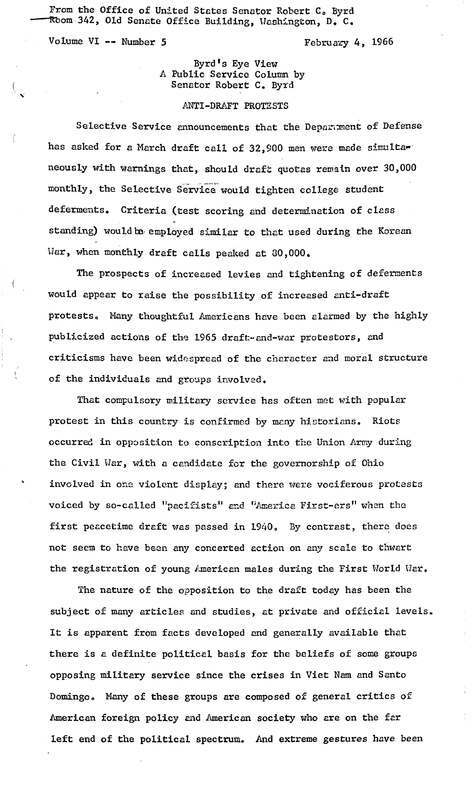 In a February 4, 1966 edition of his "Byrd's Eye View" column, Senator Byrd discusses the anti-war protests, foreseeing an increase in the opposition as the U.S. prepared to tighten the restrictions on deferments from the draft as hostilities in Vietnam increased. Following his 1965 visit to the U.S. Embassy in Saigon, Congressman Harley O. 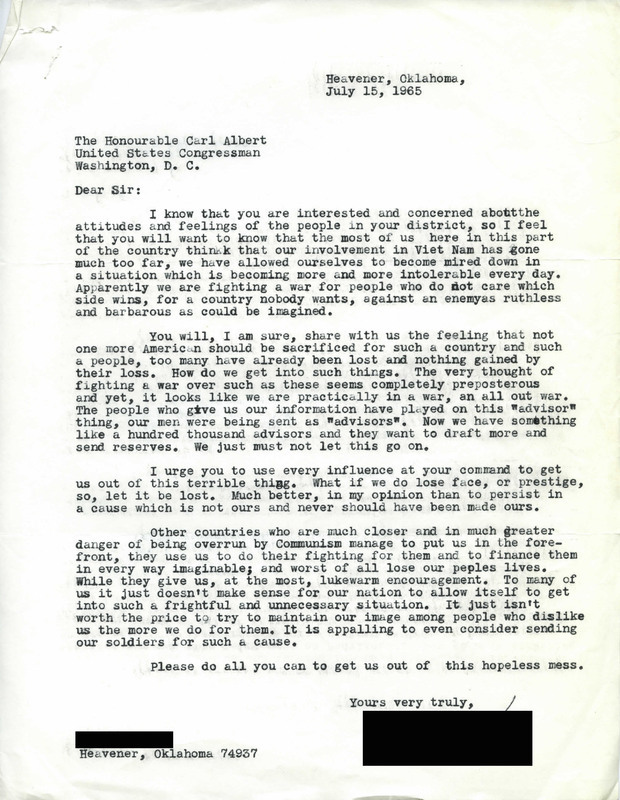 Staggers, Sr. continued a correspondence with diplomatic officials at the embassy. 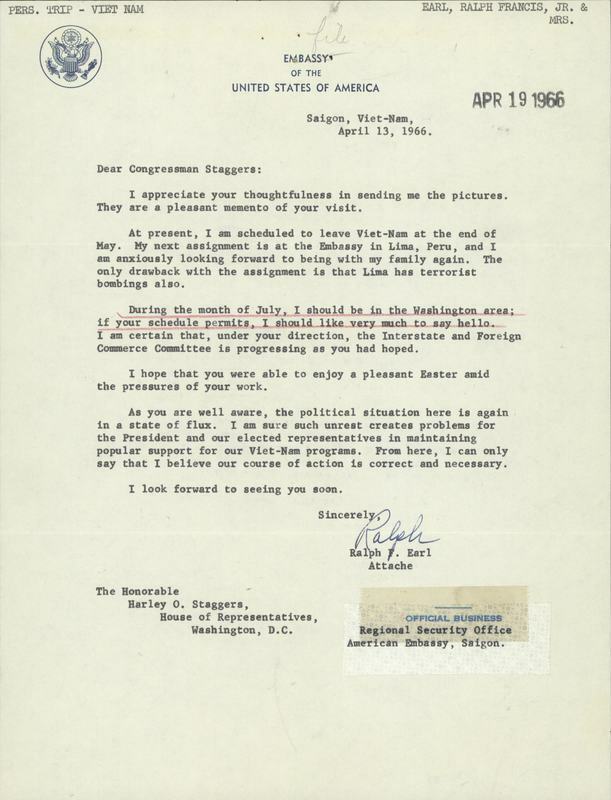 This letter from Ralph Francis Earl to Congressman Staggers, Sr. describes the political unrest in Vietnam but also defends U.S. involvement in the conflict. 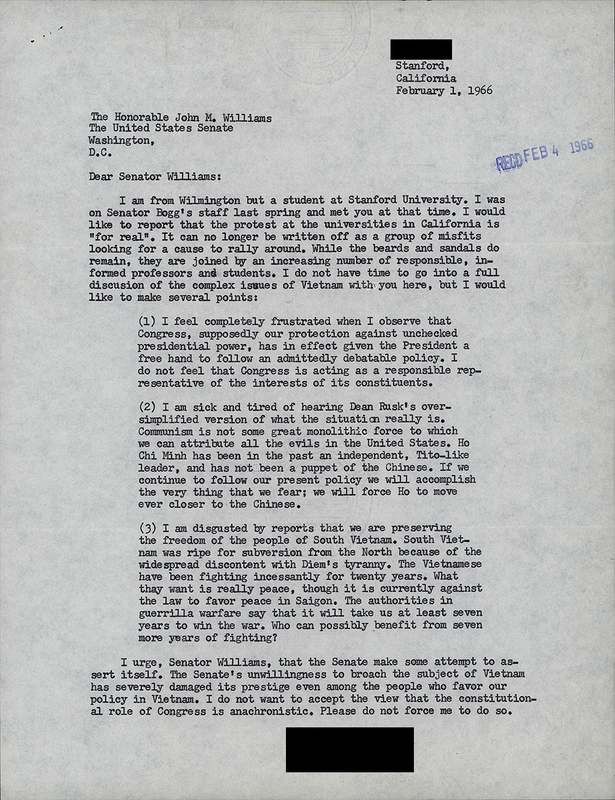 Americans all over the country wrote to Senator Williams, a member of the Senate Foreign Relations Committee, expressing their opinions and frustrations with the John administration's involvement with Vietnam. 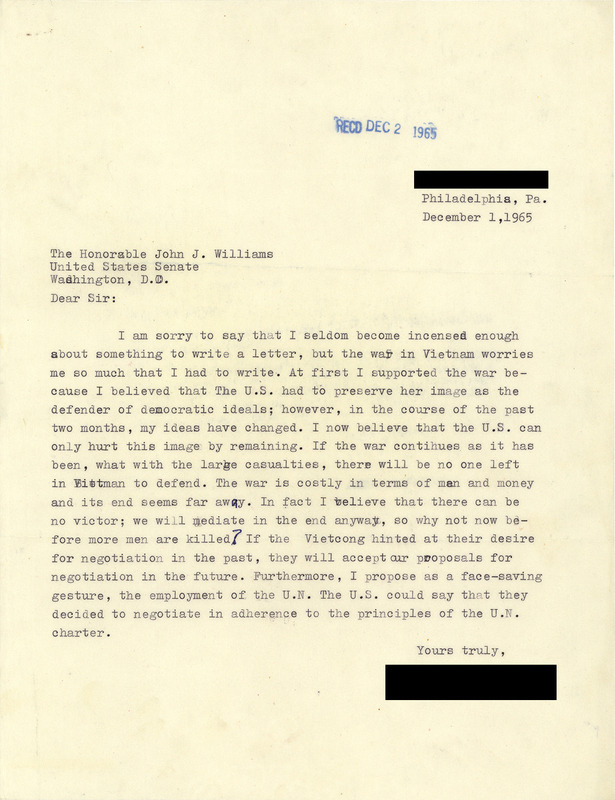 In his response Senator Williams expresses his candid opinion about why believes the United States cannot win a war against North Vietnam.